IEEE Spectrum reports on a snake-like robotic scope that slides down patients' throats and might someday slither into other orifices for colorectal or gynecologic surgery. 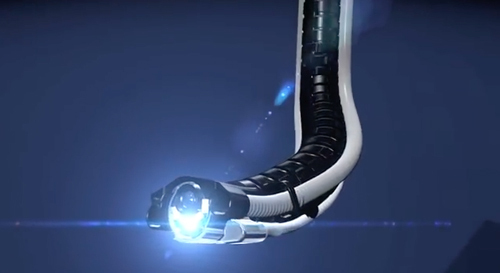 FDA approved the Flex Robotic System by Medrobotics of Raynham, MA, last year. Medgadget describes Flex's construction as "a series of interconnected mechanical components that are concentric to each other, but can be made to move in order to create overall flexion." Flex can glide through the twists and turns of human anatomy, and become rigid to form a stable surgical platform once the surgeon reaches the desired vantage point, according to a company statement.